Beefed up security at the Orpheum. Let's talk about the B-word. No. Let's talk about the C-word. 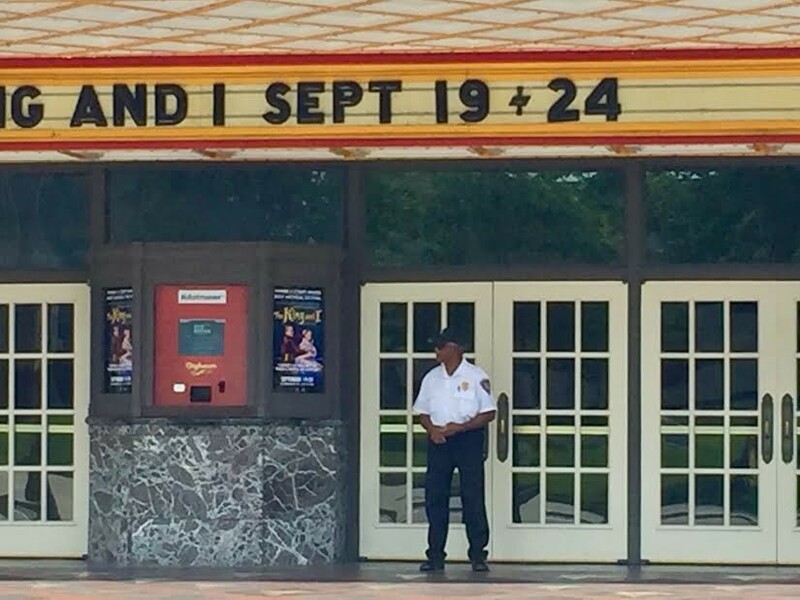 Let's talk about the fact that there's an armed guard in front of the Orpheum protecting folks with families who spend their days booking Broadway shows, coordinating the High School Musical Awards, developing concert programs, planning summer camps and curating a popular film series. 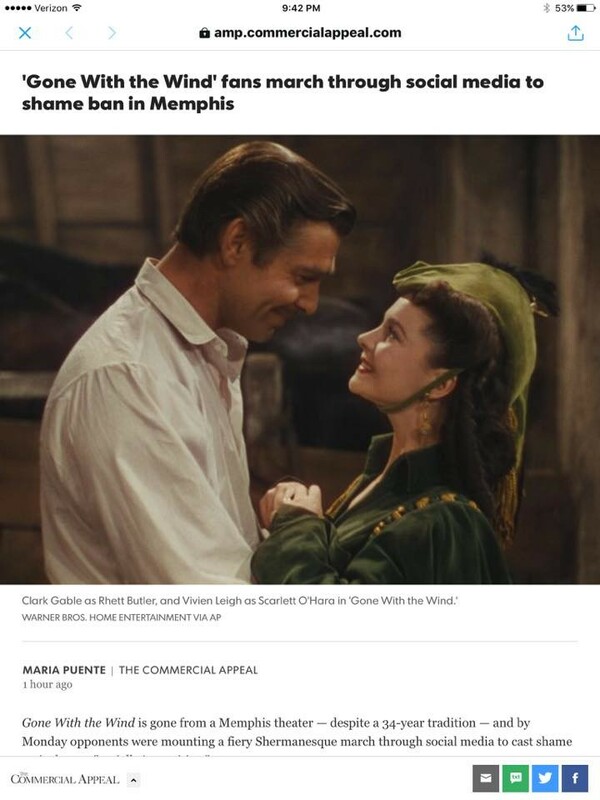 That's a dangerous job now, apparently, and media — local and otherwise — only add fuel to the fire by misrepresenting what happened there this week when it was announced that, after a good, 34-year run, the Downtown playhouse would drop Gone With the Wind from its popular Summer film series. No matter what you may have read at The Commercial Appeal's website this week, nothing has been banned in Memphis. Not Gone With the Wind or anything else. The word "banned" implies a kind of authority the good folks at the Orpheum just don't have over the distribution and screening of media in Memphis. Any mainstream media that uses that word chooses to pour fuel on a fire that, judging from the presence of the guard out front, may get somebody —probably not the author or editor — burned. The Orpheum did what every cultural institution in the country does every single day. The staff made a curatorial decision — a decision that would be valid even if Gone With the Wind wasn't controversial. Why should Gone With the Wind be a tradition and not Selma? Or Bambi or The Big Lebowski for that matter? Why should there always be room for Gone With the Wind and never room for Faulkner's Intruder in the Dust, which is more regionally appropriate, and tells a different and more vital story of the American South than the blazing, over-the-top romance of Gone With the Wind. Never heard of Intruder in the Dust you say? This is why we curate. We also curate because culture shifts, what's relevant now may not be relevant 5-minutes from now. And relevant or not, a 4-hour film like GWTW is ultimately a less valuable investment for theaters like the Orpheum than a 90-minute flick that also sells out. Mad Max: Fury Road, for example, would save the Orpheum two full hours-worth of overhead on everything from labor to utilities. So many popular films have been made since 1939, and there are only so many slots on the Orpheum's Summer series. While there's nothing wrong with reviving popular films, there are too many great films to choose from to guarantee any one a permanent spot on any lineup. Unless, of course, that film somehow speaks to a community's identity and has a renewing effect for those who attend. If Gone With the Wind is that film, what does it say about our community? Let's also take a minute to talk about propaganda like this article that begins with an admission by the author that, in 2014, he warned everybody that the Left would ban Mel Brooks' Blazing Saddles — a paranoid fantasy that hasn't, and isn't likely to come to pass anytime soon. His proof: OMG Look what happened to Disney's Song of the South! "If there is one last bastion of racism still accepted in America, it is the racial condescension we always see from the left, this constant treating of minorities, especially blacks, as children who are unable to deal with a statue or a word or a movie." The problem here is pretty basic — and ironic. Unlike the practically homogenous Right, fighting to uphold this film and its paternalistic race narratives — the Left is made of minorities as sure as Soylent Green (another slot-worthy film) is made of people. There's an even bigger problem with this kind of hysterical, and historically unsupported crankmongering. Let's forget how easily this rhetoric comes apart by inserting nouns like Watermelon and Fried Chicken in place of Gone With the Wind in the headline, and for the sake of argument, let's accept Breitbart's highly questionable stats at face value. Let's allow that 73% of African-Americans do, in fact, love Gone With the Wind so much they want to marry it and have its babies, whether they know anything about birthing or not. So what? That stat doesn't mean the film's cultural value merits a guaranteed slot on any Summer film series any more than any other classic or popular film. It's a meaningless number used in the service of specious rhetoric. Did I mention that there's an armed security guard in front of the Orpheum? Because there is. Because the folks over there made what should be the kind of uncontroversial curatorial decision that is 100% their's to make. Whether it's in light of the tragedy in Charlottesville, or just because it's Tuesday. Now people feel endangered because this vintage playhouse — a true Southern cultural treasure — wants to mix things up, expanding its offerings and its audience in the process. It's bad enough that propaganda organs like Breitbart have become so influential. But it's shameful when local media turns up the pressure by reenforcing false narratives with badly chosen language. UPDATE: To be fair as I can be the CA's John Beifuss has done great work all around. The CA's issues stem from Gannett and a culture defined by consolidation not community.